In early July, Andiamo Trust welcomed yet again apprentices from TEVETA rooted from different colleges. Amongst them are Raymond Gausi, Duncan Mwandadza and Mercy Mafaiti who were allocated into electrical department due to their respective expertise. TEVETA apprentices testing a motor after rewinding it. 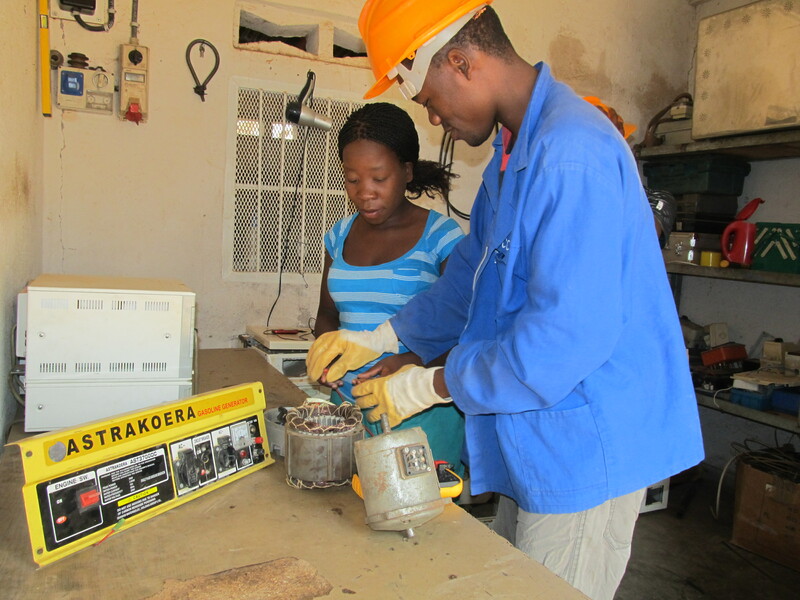 The young engineers have proved worth by resuscitating to life a single phase motor that stopped functioning on Tuesday, August 13. This is such a development for it serves the mutual purpose at once to students by daring industrial challenges and to the cooperative- durable services. Among other works the students helped wiring at Lisanjala school projects and some maintenance works at the campus. This entry was posted in Education, News from Malawi, Social Development and tagged Duncan Mwandaza, Harry Pongolani, Mercy Mafaiti, Raymond, TEVETA. Bookmark the permalink.